Figures for repeat burglaries have recently been released under the Freedom of Information Act. 43 police forces were requested to provide information about homes that had been burgled more than once in a 6 year period and 25 of them responded. These figures reveal that over 100,000 homes in these areas have been burgled more than once between 2008 and 2013. That’s equivalent to around 1 in 11 (8.6 per cent) of the 1.13 million burglaries recorded being repeat burglaries. The highest risk of being burgled more than once is in Northamptonshire with 1 in 3 houses burgled having already been targeted before. It must really compound the misery of a break in to know that you have a 30% chance of it happening again in that area. One address in Bedfordshire was burgled a staggering 9 times in this period. 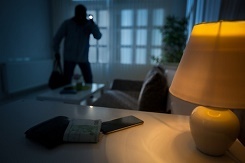 It does seem audacious for an offender to return and burgle the same property again but often they will do that once they believe the things they took have been replaced or they spotted other items that they weren’t able to take the first time. If they were able to gain access once and you don’t beef up your security then there’s really nothing to stop them doing it again. We would obviously advocate that people take proactive steps to avoid a break in by fitting a burglar alarm BEFORE they have a problem. However, for many people it would appear that the motivation to take such action only comes AFTER they’ve experienced a break in. These figures would suggest that many still don’t implement better security measures, leaving them vulnerable to a second or even third burglary. We would urge people to take positive action to prevent a break in by following home security advice and fitting – and using – a burglar alarm. Burglars will always choose homes that don’t have security measures over ones that do because they represent the lowest risk. For a quote for a burglar alarm, secure locks or CCTV contact us on 0800 612 9799 (from a landline) or 0345 833 5543 (from a mobile) or call into our security shop in Wakefield. previous Burgled by gas? Are you having a laugh?